With the re-election of President Obama, the preppers have stepped up their efforts. 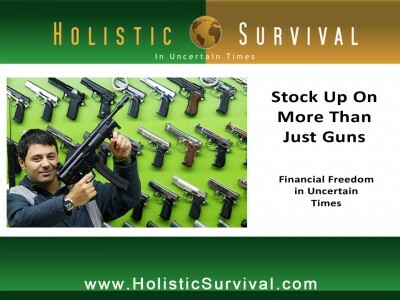 This is apparent by the rise in stocks for guns and ammunition, which soared the day following the election. The stock market as a whole dropped over 300 points, but firearms manufacturer Smith & Wesson’s stock rose over seven percent and Ruger was up three percent. Even more telling was that gun sellers are having very busy days following the November 7th election. Gun sales, particularly for tactical rifles such as AR-15s and AK-47, were on the rise and ammo was being sold out. This is a tell-tale sign that people fear an economic collapse (not to mention Obama’s own admission of limiting gun rights). So how does one prepare for the worst case scenario beyond buying ammo and storing bottled water? One way is to amass commodities which will be helpful in an uncertain future. Real estate investing is packaged commodity investing in its simplest form. A house is a collection of basic commodities – wood, nails, steel, brick, concrete – but in a form that can be rented out for an added profit. Yet Jason Hartman’s system has an added appeal, as you will be privy to tax breaks, high leverage, and high return on investment. Additionally, you won’t need to spend your money to do it. Jason is a fan of using fixed-rate, long-term loans to make the initial investment. Most investors recommend not getting involved in debt, but debt can be good, especially in the current economic times. The monthly amount can be paid by applying the rental payments from tenants. The rental community is at an all-time high. Many homeowners lost their homes in the recent economic shift, making these houses now available for the investor to purchase as rental property. Additionally, Jason is a firm believer of “refi ‘til you die,” which allows investors to take advantage of the fixed-rate conditions throughout the length of the loan.